Wolves are the largest wild members of the dog family. They live in packs and have to co-operate in order to survive. The Arctic Wolf is a highly resilient animal which inhabits some of the most hostile terrain on earth. Order: Carnivora (carnivores or meat-eaters). Length: Head and body, 100-150cm. Weight: Up to 80kg. Females lighter. Sexual Maturity: Males, 3 years. Females, 2 years. Mating: March. Gestation: 61-63 Days. Number of young: Usually 4-5. 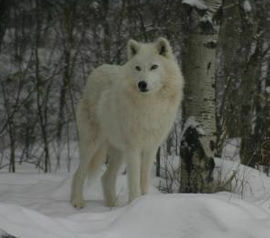 The arctic wolf is a highly resilient animal. It has to be, as it inhabits some of the most hostile terrain on earth. The air temperature in its hunting grounds does not rise above -30°C in April, and this combines with wind chill to cause temperatures of -100°C or less. The ground is rarely unfrozen, and when a thaw occurs, it affects only the top few centimetres of soil. As the soil is poor, food for herbivores is also limited, and as the winter comes, the wolf's prey, large grazers such as musk ox and caribou are driven south to seek out better food. The wolves follow their prey south, returning to the north the following spring.